Friends of the Medallion have a shared passion for preserving and telling the stories of extraordinary Oklahomans. Their support sustains the 90-year tradition of recognizing accomplished Oklahomans with the state’s highest honor–induction into the Oklahoma Hall of Fame. Just as the symbols that make up the Hall of Fame medallion reflect and celebrate Oklahoma’s rich heritage, so do the donors who make up this group. 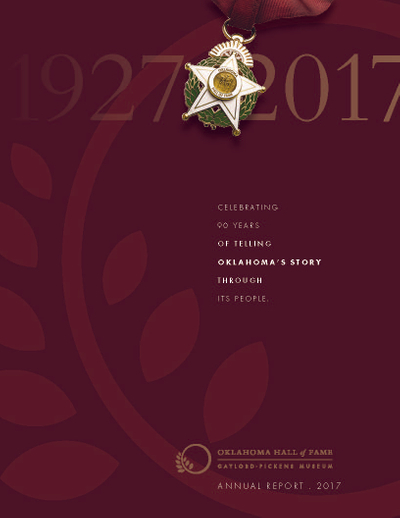 Their commitment to sharing the inspiring stories of their fellow Oklahomans allows the Oklahoma Hall of Fame and Gaylord-Pickens Museum to create educational and inspiring programs to share our unique stories and instill state pride. As thanks for their contribution at the $1,000 level or higher, Friends of the Medallion enjoy special benefits and opportunities to connect to other influencers who are committed to the organization’s mission to tell Oklahoma’s story through its people. They show their dedication to telling Oklahoma's story through its people by making a commitment of $25,000 or more to the support of the Oklahoma Hall of Fame's programs and operations. Listed below are the special recognition and benefits available to Mission Partners as thanks for their generous support. Click here to see a list of our current Mission Partners. *Event space must be used within one year of contribution and is subject to availability; additional fees may apply. To reserve your use of an event space, please contact Bailey Gordon at bg@oklahomahof.com. For more information about becoming a supporter of the Oklahoma Hall of Fame and Gaylord-Pickens Museum, please contact Bailey Gordon at 405.523.3207 or bg@OklahomaHoF.com.